Monday was a pretty laid back day. I slept until 6, when Dan woke up for work. I got dressed, worked around the house, went to gym, WW, and then to have lunch with Dan and his coworkers. Yeah, I showed up in my gym clothes with no makeup in Georgetown. Georgetown is not like Austin, where coming from a workout is completely normal. I’m sure he was embarrassed. I made 2 grocery store stops and then home. 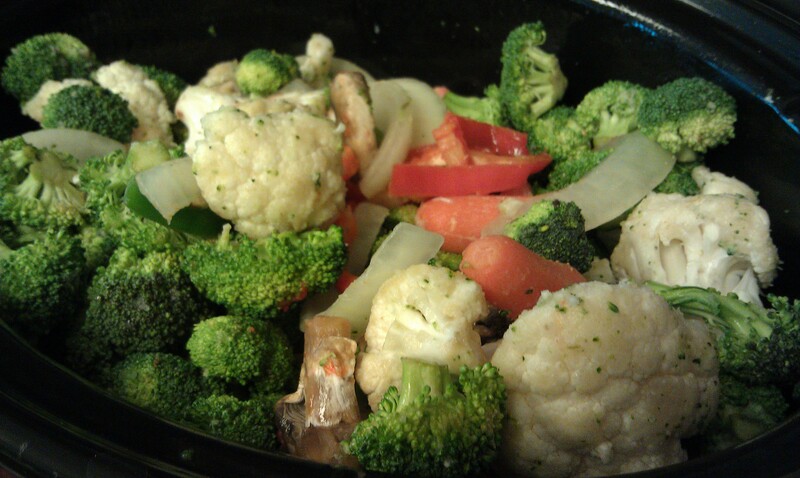 When I got home, I roasted some veggies in my crockpot to store for later (I froze half of them). I filled up my whole 6 quart pot with veggies from the clearance section at Sprouts. 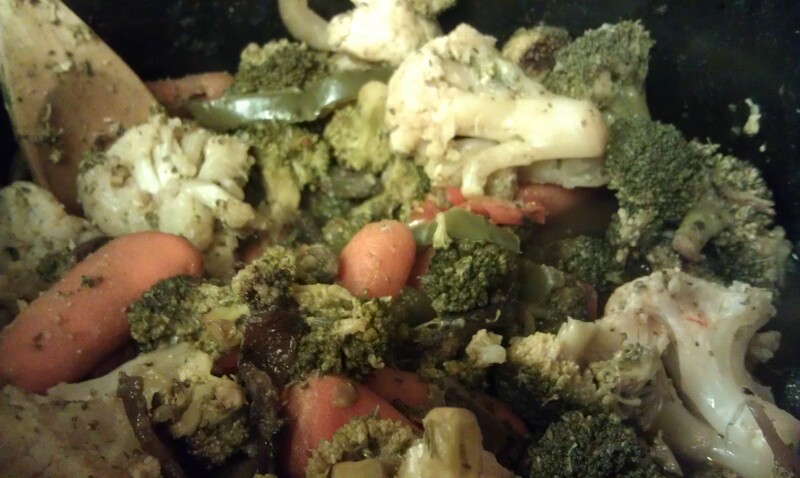 3 bags of broccoli and cauliflower, 1 tray fajita vegetables, 1 package of mushrooms, and then 2 cups of carrots (from my fridge). Cooked on low with a package of Ranch dressing powder (check brands for gluten) and EVOO for 4 hours. It reduced the veggies in volume A LOT! Three 1.5 cup servings went into containers to mix with eggs for a breakfast option, the rest went into the freezer for another time. I got into catching up on emails, blogs, work, etc. Before I knew it, it was 6 pm! Monday night dinner didn’t go so well. I made a new recipe for spaghetti and meatballs which I thought was amazing. It turned into my lashing out at Dan for not eating his dinner. I should know better, the only spaghetti and meatballs he will eat is his mom’s. I think as soon as he saw green stuff in the meatballs (fresh parsley) he was done. What made me more upset, is that i’d already portioned his leftovers out into a container with pasta for him to eat on Tuesday night when he got home from his first day of school. I ended up having to throw it away, because i’d already contaminated that serving with gluten. UGH! 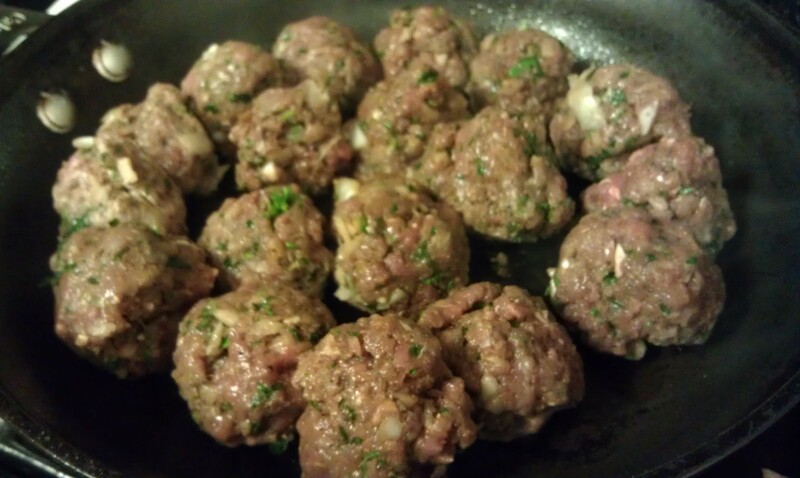 Meatballs: In a bowl, mix the beef with all ingredients. Roll into 1-inch balls and set aside. Sauce: #1 Heat olive oil in the bottom of the saute pan. Add onions and cook over medium heat for 8 to 10 mins, until tender and translucent. add the garlic, cumin, pepper, cayenne and parsley and cook for 5 more minutes to blend the flavors. stir in the tomato sauce and beef broth and bring to a simmer. #2 Brown the meatballs in a pan over high heat with a little oil. Then add to the sauce, cook for 15 mins. *I really liked these. 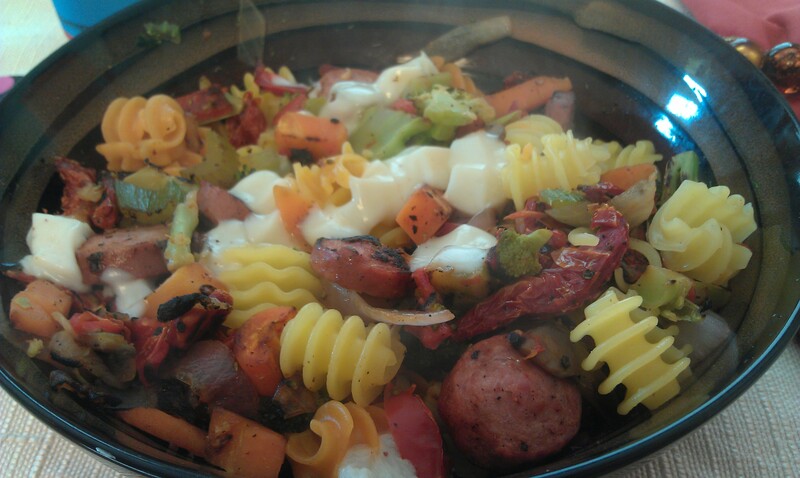 I would make this again for myself for lunches or for my parents, which I am sure would like it. In fact, I forwarded them both the recipe. My dad recently chose to go Gluten-Free due to a Dr’s urging because of severe inflammatory issues. 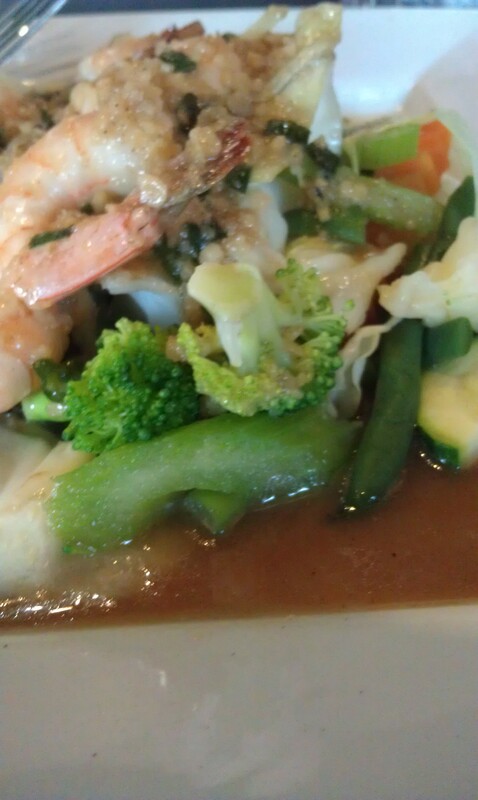 L: Thai garlic shrimp (out with Dan and his coworkers). It was large and delicious and I ate every last bite. Didn’t eat the soup that came with it, I was sure it was thickened with some sort of flour or starch. 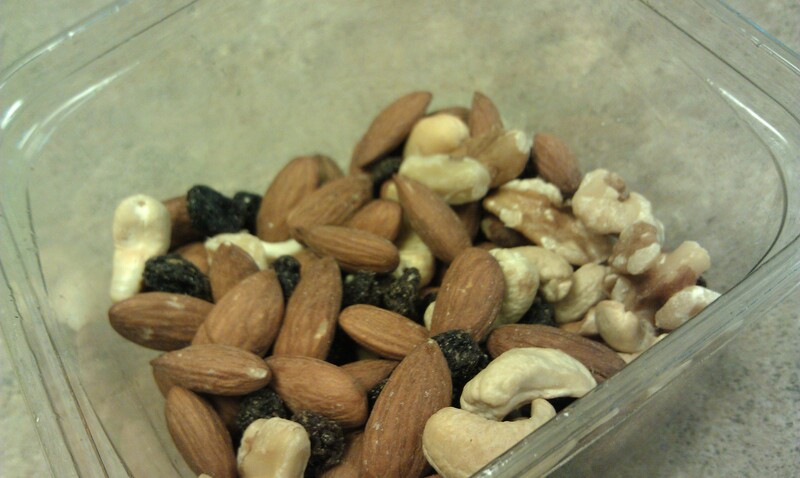 S: apple and raw premium mixed nuts. The nuts were on sale because they had Christmas packaging at HEB. Do I care about the package? No!!! 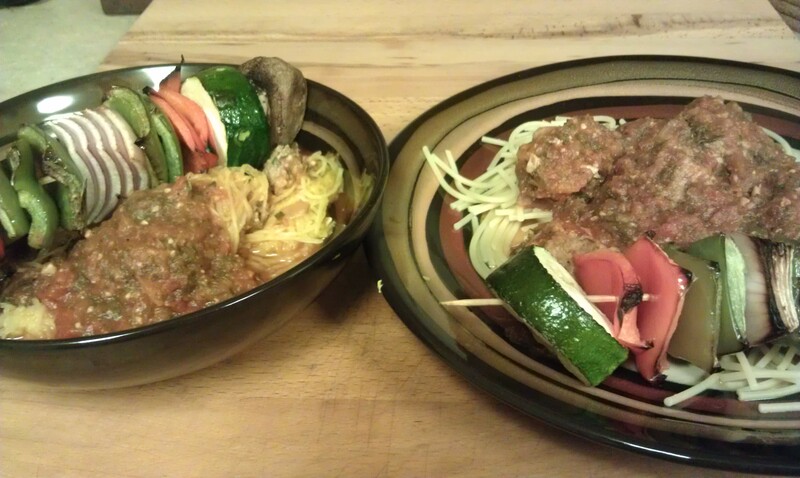 D: venison meatballs, veggie kabobs, over spaghetti squash, EVOO. It was a productive day, but it didn’t really end well. I was still upset about dinner when I went to bed. I once again suggested to Dan that he needed to start participating in meal planning (which he doesn’t currently do). He agreed it was a good idea, hopefully this time he will sit down with me and say what he wants 😉 Ugh, boys! 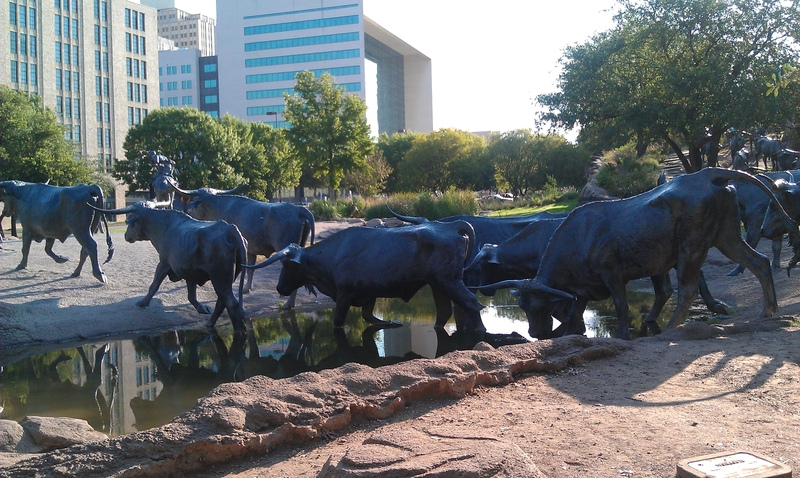 Entrance to Dallas Convention Center (I remember this from the RNR 2010 Race). Welcome Display, thousands of GORGEOUS Tyler Roses. 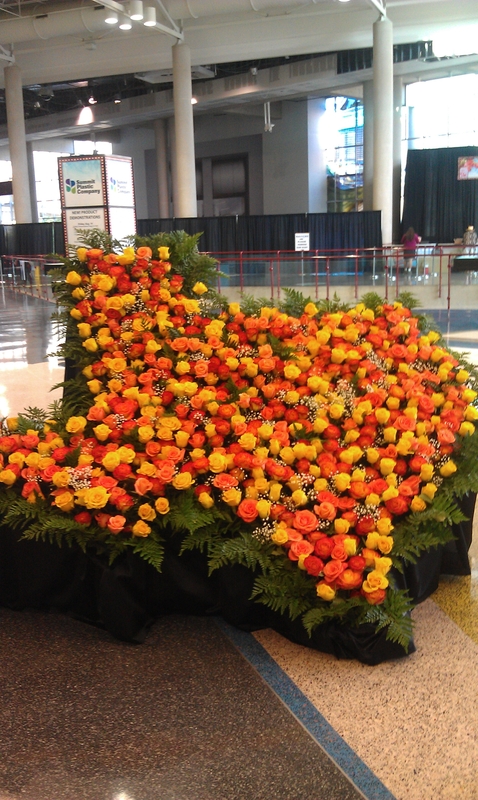 There were at least a hundred of vases of the same color roses all over the convention center. I really wanted to take a vase of them home, but I knew by time I got home, they’d be ruined. It was a long but productive 4 days. Worth the long hours and working through the weekend. And it was nice to travel with my coworker that has very similar tastes in food, clothes, and entertainment. Plus she’s a joy to be around. Even at the mall 3 days in a row after work during tax free weekend, which was her idea. I didn’t buy anything, can you believe that? Urban Grill. Really great salads and mediterranean inspired food and was within walking distance of the Convention Center (although what IS walking distance when it’s that hot?). 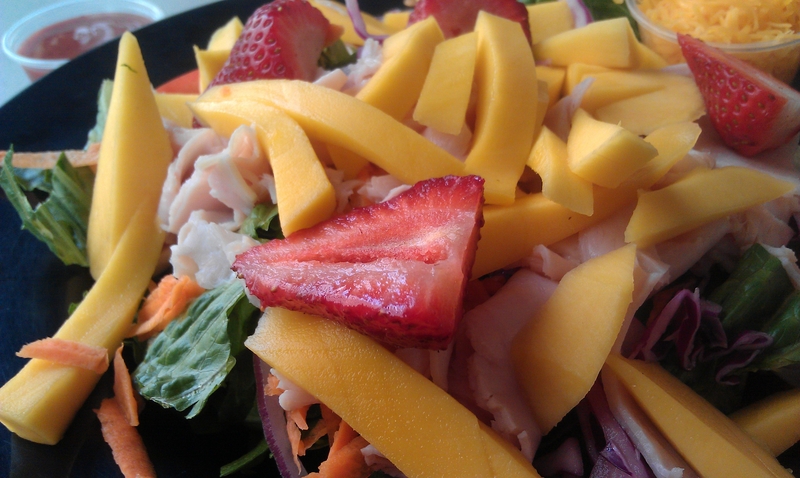 Turkey Mango Salad (salad, tomato, red onion, strawberries, mango, turkey). Also had cheddar cheese, which I didn’t eat. Dressed it with EVOO. Had a ton of great flavors! I liked it so much I ate there Thursday and Friday for lunch. Friday I chose a different dish. Flying Fish. One of the best Mexican Shrimp Cocktails i’ve ever had (plus it was HUGE). Not sure why I don’t have a photo. Everyone’s food looked so fresh and tons of great flavors. I got my cocktail spicy, which had fresh jalapenos. I could have eaten there every meal. 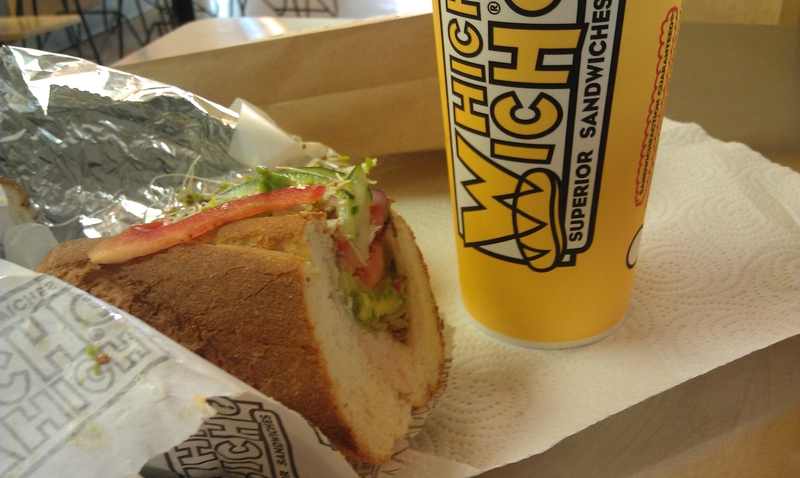 Which Wich now serving Udi’s Gluten Free sub bread! Turkey Avocado Swiss with tons of veggies. I love their fresh veggies, the best of any sandwich shop I know 🙂 And I love the fact that they have Minute Maid light lemonade, which I mix with their iced tea. Desperados Mexican. Shrimp Oaxaquenos. 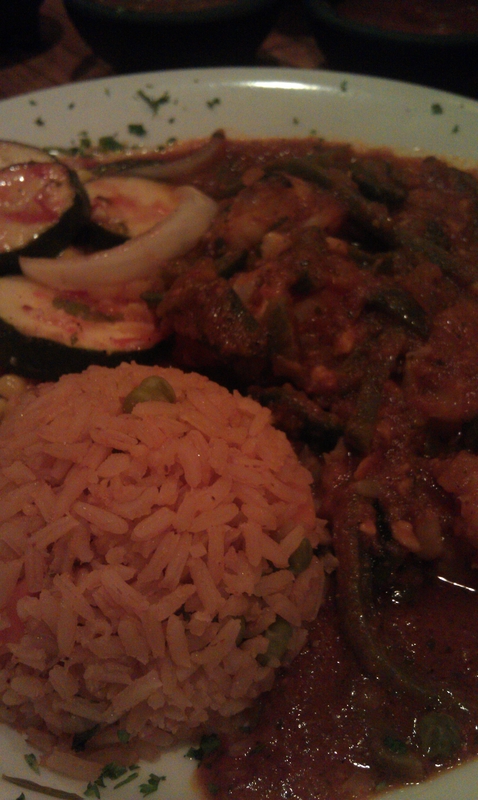 Shrimp in a spicy red sauce with jalapenos, mexican zucchini, and rice. 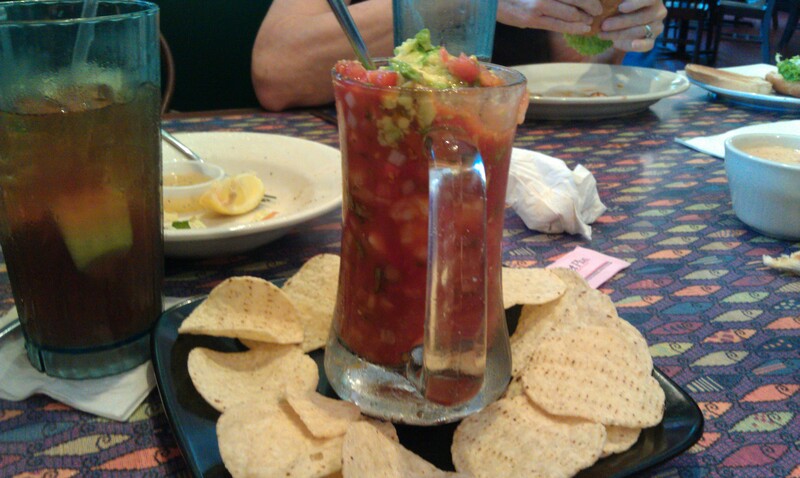 The food was awesome, as was their chips and salsa. I didn’t care for their rice (I am a mexican rice snob). They are well known for their margaritas, tacos, and their signature dessert, the fried latte. I didn’t have room to try it, but it sounded really interesting (may be worth the trip back one day). I stuck with the hotel gym Friday and Sunday mornings, since I didn’t have a car those days (we were multi-tasking while up there, so I gave the car to a coworker for 3 days). For Saturday I demanded I have access to one of the cars (which I got). 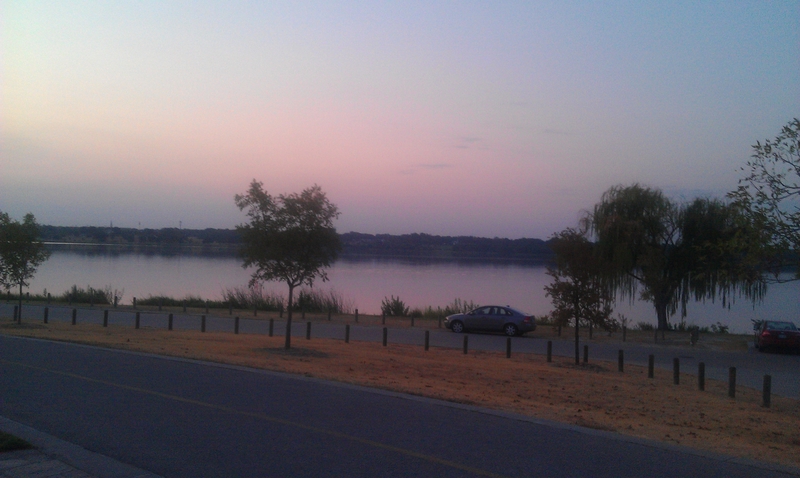 I headed to White Rock Lake, where I was certain I could have a nice safe run. I didn’t run the route i’d planned, because I pulled into the first lot I saw, parked, and ran. I wish I’d started a little earlier than 6:15, but it took me longer to drive out there than I’d estimated. I think the non-stop going didn’t catch up with me until today. I’ve been dragging all morning and did not make it to the gym. We have plans tonight after work. Maybe I’ll do something quick after work, but that’s unlikely being as i’m half asleep still. Not my usual pick, but I was interested. It turned out to be quite tasty and a good change of pace. ~Great on veggies and chips. Tried both, loved both. 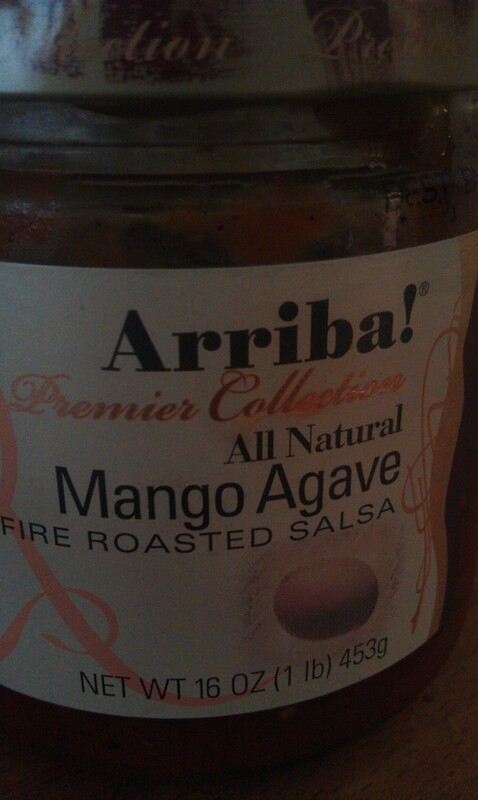 ~Would be great on egg dishes, tofu, fish, etc. Started out with DIY pizzas at my house Friday night. It was sister’s turn to host parents, but they weren’t home, so I entertained mom and dad for the evening 🙂 I was out of GF crust, so I made pizza GF pasta for myself. Turned out fabulous! Then the grand opening of the new Rogue store all Saturday morning. Then mom’s choice. Shopping. And boy was it HOT. And all of the places we went were open air, so hot and sunny with no AC. BLECH! And I wore jeans because my legs may have needed TLC. Lunch at Fish City. Sister and mom’s first time. They loved it. Very large and varied menu. Something for everyone. They have one of the very best Mexican Shrimp cocktails. Perfect with a salad on the side. It’s spicy and SO good! More shopping. Somehow my sister and I bought stuff and mom bought almost nothing. I had a Christmas gift card i’d not even attempted to spend at Ann Taylor, so I killed that sucker. 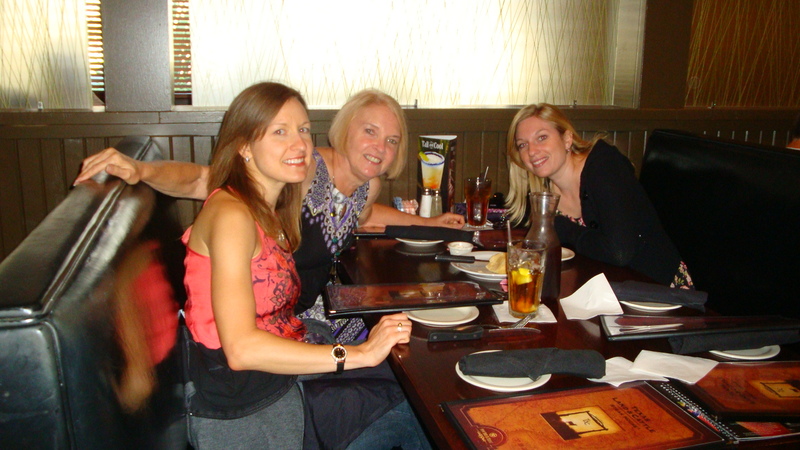 Mom wanted a steak dinner, so the 3 of us and our boys went to Texas Land and Cattle for dinner. Another 1st for mom and sister. They loved it. Mom and I both got the signature sirloin which is smokey peppered goodness. A little sad because mine had so much fat I had to cut off, mom’s had almost none. That’s ok, because their sweet potatoes rock. She got a chocolate miracle cake and a peach bread pudding for dessert. Verdict was that the bread pudding was really good, the cake was overrated. I am not a big chocolate cake person, but I could tell I wouldn’t like that one especially. Looked like a fancy grocery store chocolate cake with too-sweet icing. The only person who liked the cake was sister’s other half, who ate most of it. He’ll eat anything with icing on it though. I doubt I would have eaten much, if any of either dessert if I could of. But in the 15 minutes spent on dessert at the table, I felt VERY out of place. That doesn’t happen very often at all. So strange. 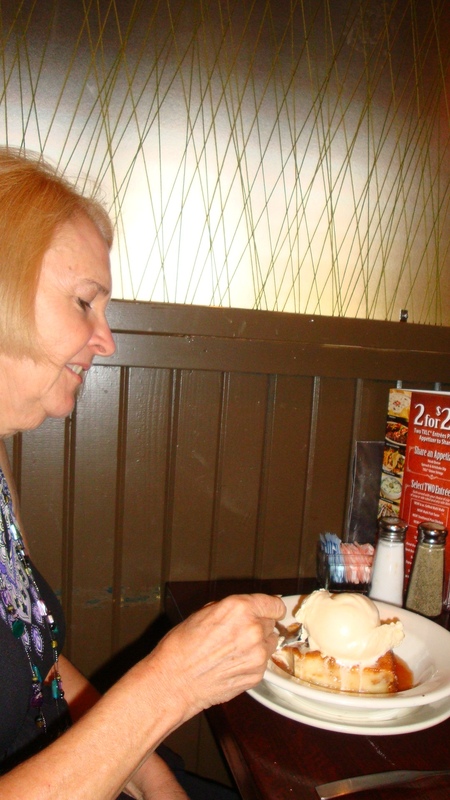 We rarely order dessert out anyhow, but mom didn’t want a cake, she wanted whatever the restaurant had that looked good. 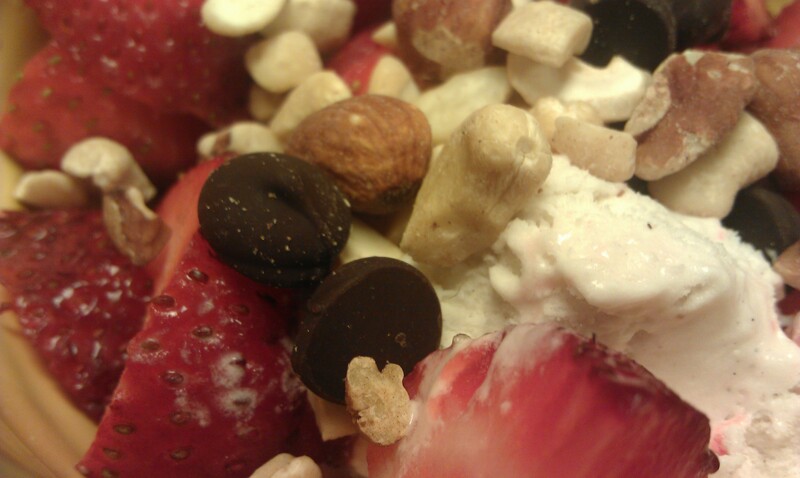 When I got home I went to HEB plus for some vanilla bean Nada Moo to make myself some dessert with strawberries, raw premium nuts, and dark chocolate. This weekend was actually my Nada Moo anniversary, lol. One year ago we did a race for Autism with a GF food fair for mom’s birthday. Nada Moo was a vendor there. It’s good stuff. I wish more places carried it. Great Saturday despite the heat. Girl time with mom and sister and I got to see Dan for a few hours before he left for Canada early Sunday morning. One of the reasons I was MIA since last week, is that I went home to see my parents Friday-Saturday afternoon. Mom was having a garage sale and needed help. And then we were busy with a Ryan Bingham show Saturday night, then Dan’s work had the suite at the RR Express game Sunday. Good times, but exhausting. Oh and I may have put all of our dishes in mom’s garage sale….and never found ones I wanted to replace them. Paper plates until I can find dishes I like, haha! While I was home, apparently mom and dad also needed help picking their AWESOME garden. 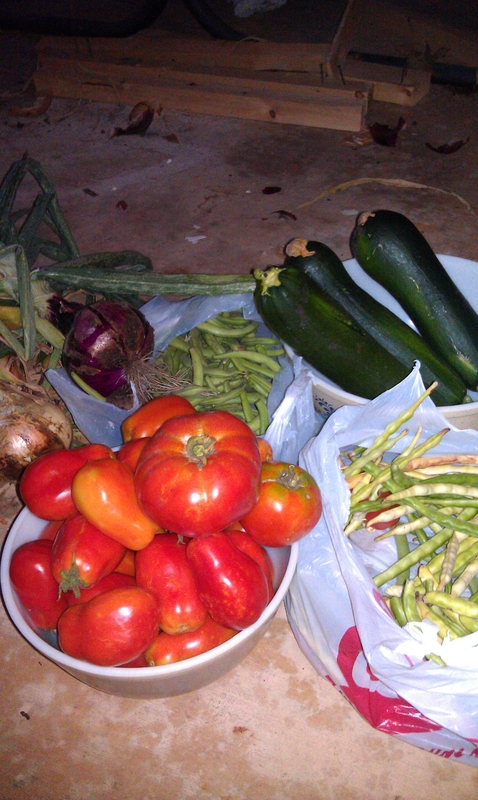 I brought home 3 different kinds of tomatoes, cucumbers, green beans, black-eyed peas, zucchini, jalapeno, red and yellow onions. There was much more, but because I knew I was going out Saturday and Sunday and then leaving town Monday-Tuesday, I didn’t want to take too much. I roasted the zucchini for lunch on Saturday during mom’s garage sale. Paired it with turkey, hummus, and swiss on FRESH pumpernickel bread from Haby’s Bakery in Castroville. SO good. I didn’t know what to do with the peas. So I made Cowboy Caviar, although I’d never tasted it before. 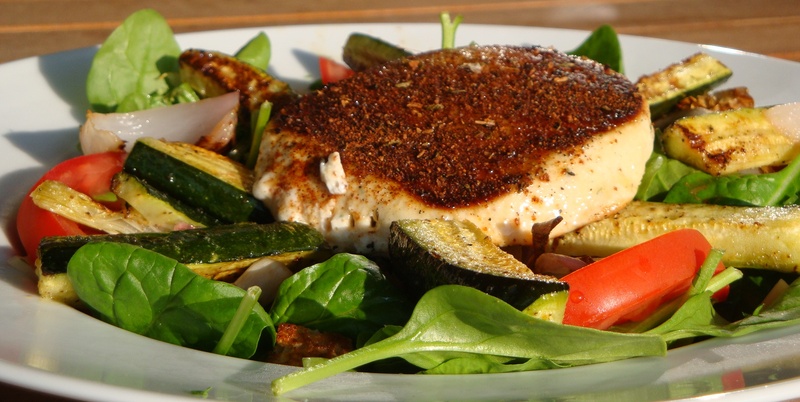 Everything in the dish came from their garden (minus the spices and dressing). All produce was fresh from the garden. 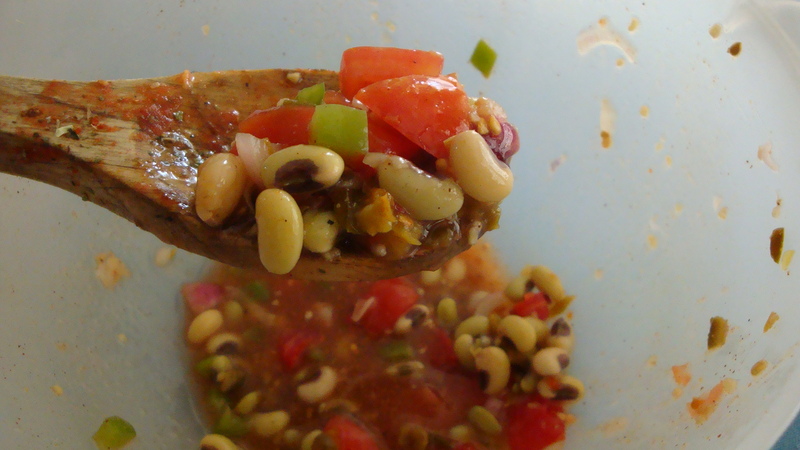 Combined cooked black-eyed peas (I steamed mine), about 6 diced tomatoes, diced onion, diced jalapeno. 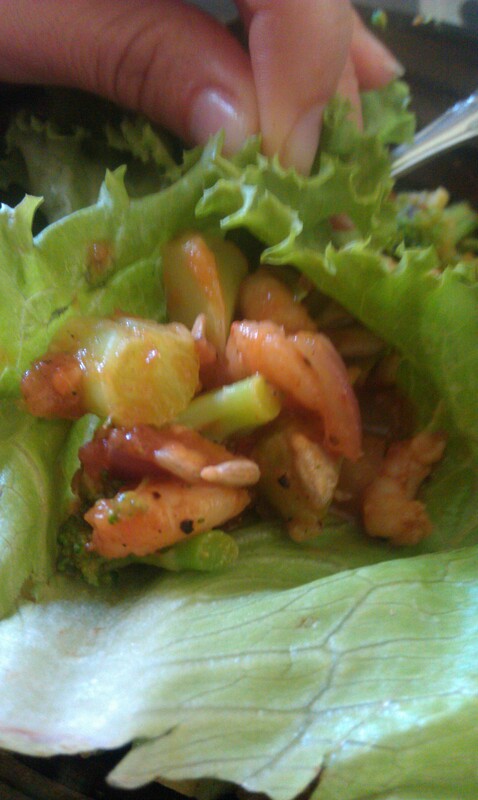 Then added some cayenne, coriander, pepper, and italian dressing. Let sit for at least 2 hours. I didn’t really measure anything except the dressing, I used a half cup. It was great and I was shocked that Dan liked it too. It was also good as a leftover. Once I had it over salad. Another lunch I had it with diced turkey, cheese, and avocado added. Simple and YUM! Very P+ friendly too. My servings were 2P+ each. To use more of the fresh produce, I made Shrimp Fra Diavlo with steamed green beans. 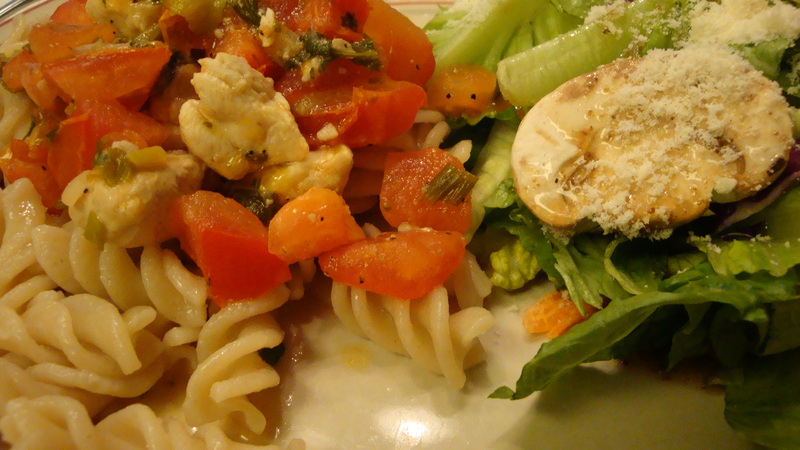 Also put all fresh ingredients from the garden in this one. The shrimp wasn’t fresh, it was from the boat I bought off of in Port Aransas. Heat the oil in an oven proof skillet over a medium-high heat. Add the onion and cook, stirring, until softened, about 3 minutes, then add the garlic and cook for 1 minute. Add the tomatoes and Italian spices and bring to a boil. Reduce the heat to medium-low and let simmer for about 5 minutes, until the tomato juices thicken. Remove from the heat. Stir in shrimp and season with salt and pepper. 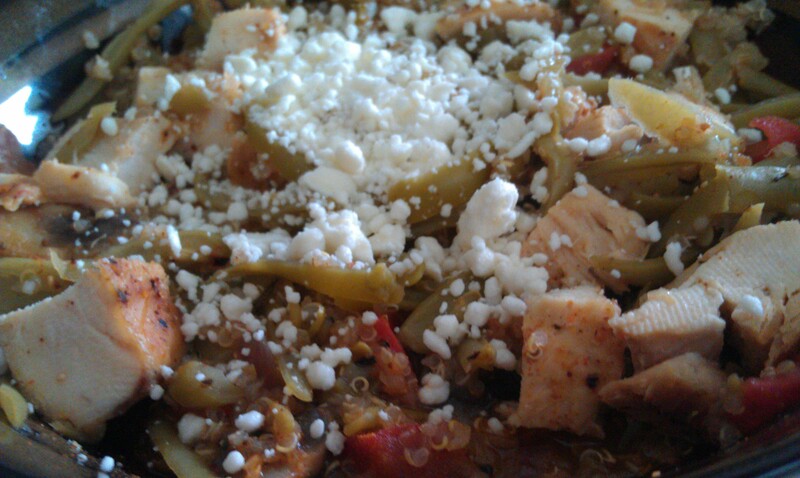 Sprinkle the feta over the top. Bake until the shrimp are cooked through and cheese melts, about 12 minutes. This one is new to me, anyhow. It’s been marked with a star in my reader forever. 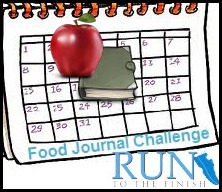 It’s a recipe that Megan posted that is one of her mom’s specialties. I honestly hadn’t tried it yet because tomatoes have looked/tasted crummy and been pricey. This week Sprouts had big gorgeous tomatoes on sale. Best part was, they tasted as awesome as they looked 🙂 I don’t usually use butter, but it’s a small amount and I figured it was much needed since it is “scampi” afterall. In a skillet heat together butter, olive oil, green onions and garlic. Add lemon juice, chicken, salt, pepper and parsley. Continue cooking and stirring until chicken is done. Add tomatoes, cook and heat through. *Halved the recipe because there are only 2 of us (just the chicken, butter, and EVOO). I marinated my chicken first in italian dressing. First night served it over pasta (wheat for Dan, GF for me). 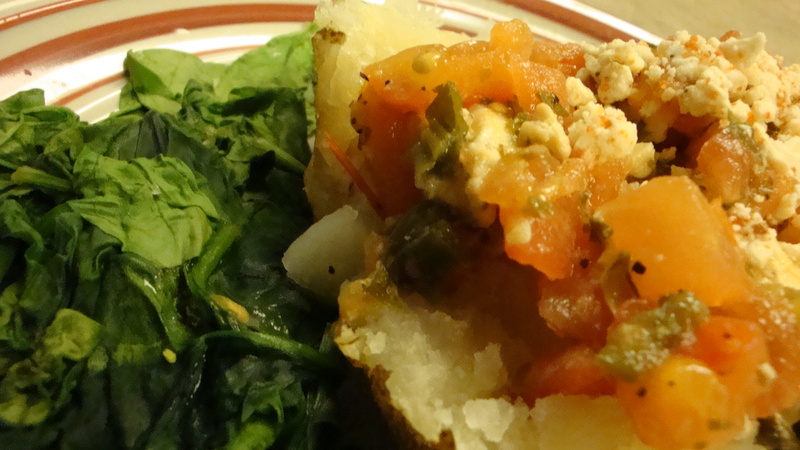 2nd night served it over baked potatoes (Alton Brown method). I think it would be great with shrimp, tofu, or no meat at all. The sauce really is fresh and tasty. And then there was the discovery of gluten free tuna burgers at Super Target. Can’t say i’ve ever had a tuna burger, but I love tuna steaks, tuna sushi, and canned tuna. I snatched them up for a try. Friday is usually my DOR, so that was a given. I’d originally thought about walking to Starbucks (a mile) to get a latte, but then I decided I didn’t really want the latte, so I enjoyed breakfast on the patio with Chanel. Worked from home in the AM, which isn’t usually allowed this time of year unless it’s something urgent. I got so much done, it wasn’t even funny. I hope that once things settle down, I can start working from home at least 1 day a week again, because it’s highly productive and good for my sanity. Noon rolled around and I was getting hungry. I just made up something random for lunch. I was looking for meatless and filling. So shrimp chalupas (sorta) were born. Corn tostada shells, refried beans, Nacho Momma’s Queso, Normandy blend veggies, onions, and of course some shrimp (which i’d sautéed and dusted with Emeril’s essence). 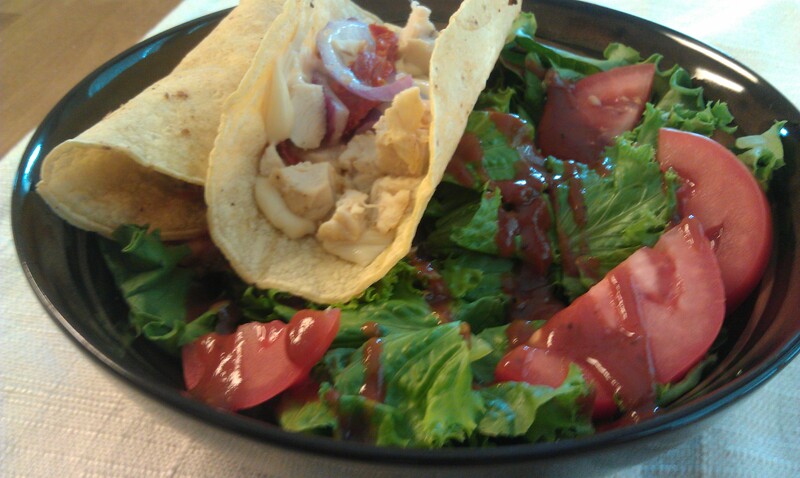 Not the prettiest food, but it was darn tasty…and filling too! Then I cleaned like a madwoman. Mopping, scrubbing, washing, etc. My house looked awesome by time Dan came home from his trip. I whipped up some Shrimp Rolls for dinner. Then we ran up to Georgetown to pick up Dan’s motorcycle which he’d dropped off for service. On the way home we had a yogurt date. Was only about 6 months overdue, lol! I have 3 Groupons to our favorite place and hadn’t spent a single one, so we headed over to Berry Cool and enjoyed a nice break together. Cheesecake and pecan praline yogurt, YUM! I do know that I will not be putting dried blueberries in my yogurt again. I think I am still picking them out of my teeth. Headed home to watch Friday Night Lights 🙂 I’m going to be so sad when the show is over (I know it’s already over, but not for us yet, since we are watching it as it airs on regular tv). We both needed a chill evening, it had been a LONG week for all.